The following are pictures of Schmölln, Germany, a town my Dad’s Infantry Company occupied in the waning days of World War II. The pictures from July of 1945 are from the photo album of Donald Katz, the Captain of Company I-304-76. The pictures from 2010 are from my nephew Dave Keefe, a US Marine who visited the town to honor his grandfather’s service in the War. Note: Click on pics to see larger. The last two pics are of the mess hall. Here’s a close up shot with 1st Lieutenant Richard Keefe on the left (my Dad) and 2nd Lt. Jay Hamilton on the right. The lettering on the window states “International Casino” because their cook was a chinese-american. Back in 2002 I interviewed Frank Mucedola, the Tech Sergeant for Company I’s 3rd Platoon, and he had this to add. 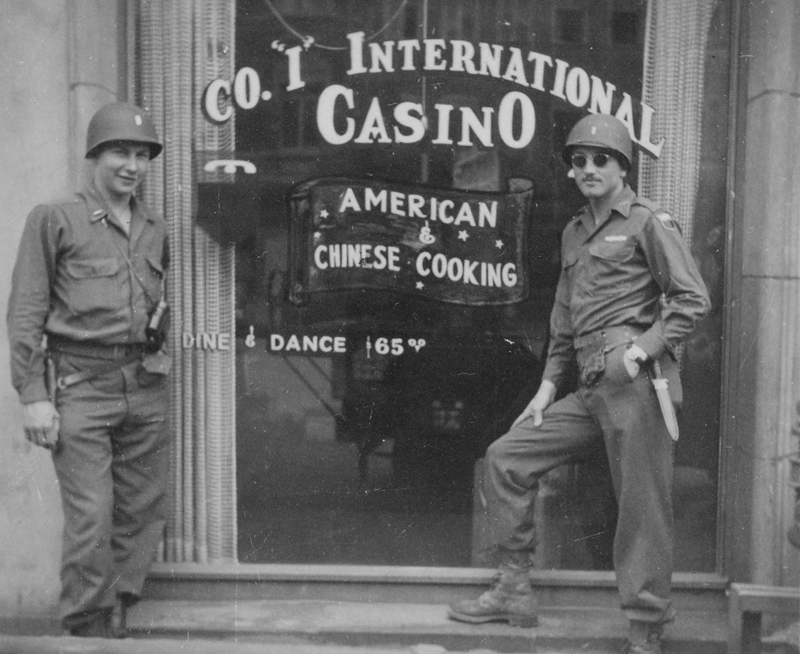 “I don’t know whether you can read what it says on the window or not but it says “Company I International Casino – Dine and Dance: $65.” The gimmick there was that regulations during that period of time were that the troops, meaning the American troops, could not fraternize with German women, or fraternize period, with any Germans – of course most of them were German women. Now, if you got caught fraternizing it cost you one month’s pay. Now the basic pay in those days for the private was 65 bucks. So my pay in those days was $114, so if I got caught I’d be fined $114. If you’re father got caught and his pay was $200, he got fined $200. So the private, his pay was $65, he got fined $65. So that was the gag “Dine and Dance $65”. With Germany’s defeat, the German civilians in Schmölln considered themselves relatively fortunate to be in American hands, as towns east of Schmölln that were being overrun by the Russians were being devastated due to the a fierce hatred that existed between the two countries during those war years. 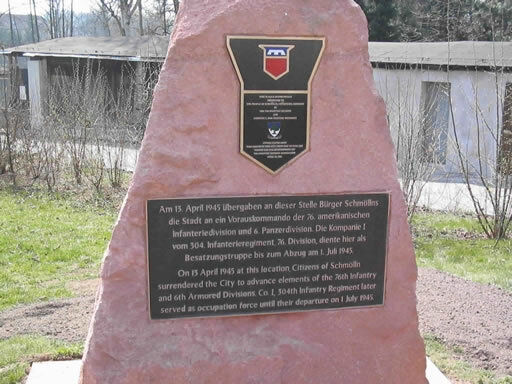 In 2003 the people of Schmölln installed a plaque in remembrance of the Americans who occupied their town that half century ago. 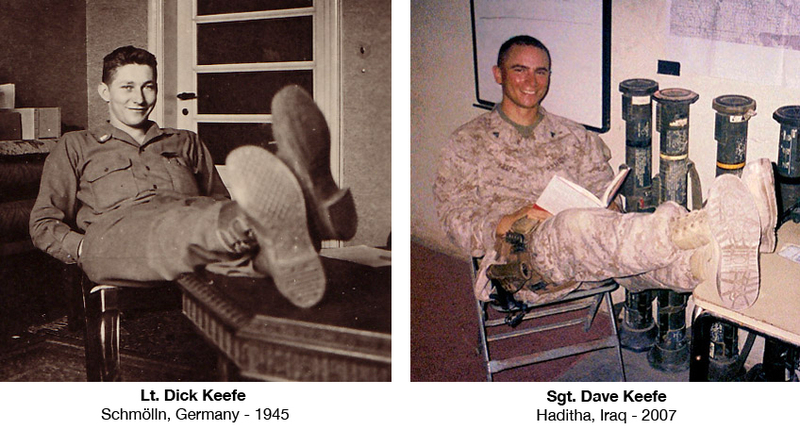 To end with, here’s a Then and Now pic of Richard Keefe (1945) and his grandson, David Keefe (2007). This entry was posted in Company I and tagged Company I, David Keefe, Schmölln. Bookmark the permalink.